The foreign exchange market or the forex is concerned with trading of international currencies. Trading with international currencies requires information about different entities. Such information is now available on the web with many sites focusing specifically on forex. Here are some of the top forex sites offering currency trading platforms, discussion boards and the latest news. This site provides comprehensive information required to trade international currencies. All the important events from across the world are provided in a calendar. The site offers a detailed coverage of specific currencies through charts that can be customised depending upon the preferences. Forums and details about the live trades are also available. There is also detailed information about the currency trading brokers. This is the currency trading broker that provides access to a currency trading platform. The platform is available for individuals and corporations. The company has been online since 1996, and provides web based, desktop and mobile application to trade currencies with low spreads. It offers MetaTrader 4 for automated currency trading. The site has a currency converter that can work based on live or historical exchange rates. This site also offers the ability to send money globally. This is a Cyprus based forex broker and social forex trading network that can be used to connect with other traders. Discussions and learning of the market can be done on the site. eToro provides complete access to the global markets. The site claims to have close to three million users and provides top ranked users on their website. They even allow to copy trading top ranked users with real money. It provides desktop software, web based and mobile application to trade various currencies online. They allow trading many Currency Pair and offers leverage of upto 400%. This site provides all the strategies designed to get the best out of trading in forex markets. There are several articles that also discuss the markets. The site has a special trading course available for the beginners, while a discussion board is also present. Live trading commentary and currency trading videos are also provided in the site. This is a comprehensive site for the traders and investors in the forex market. It provides technical analysis, information about the brokers, latest forex news, opinions, and detailed charts. 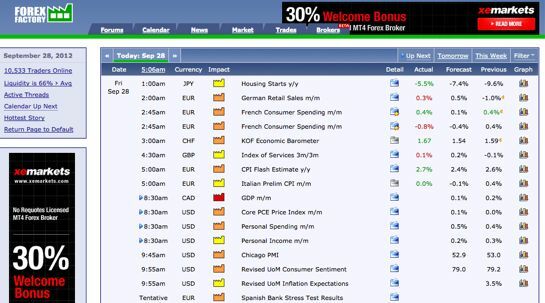 There are various trading tools and calculators along with the economic calendar. This is a site providing complete coverage of the latest forex news and the upcoming economic events. There is a discussion board to interact with like-minded people, while technical analyses of various aspects of the market are present as well. FXOpen provides access to a powerful trading platform. The site also has all the latest news about the market and the economic calendar. There are various tools to analyse the market along with basics for the beginners. This site provides the latest news about the currencies market along with expert analysis and opinion. There are webinars and educational tools for the beginners. The fundamentals and technical aspects of the market are also analysed. This site provides a beginners guide to forex trading. It provides information about the upcoming financial events, the complete guide of the forex brokers, a comprehensive list of currency converters and forex calculators. There is a system designed to teach various aspects of currency trading in various levels. This site provides information about the commodity and forex trading and platform to trade currencies online. There are various trading platforms available on this site. Daily briefings, market analysis, and trading signals are some of the information offered under the research section, while comprehensive coverage of all the aspects is provided under the education section. They provide practice account with $100k in account. With real accounts, user can get leverage of upto 200:1 and spreads from 2 to 6. This site provides access to various trading platforms available on the likes of mobile, desktop and web. There are market tools like risk calculator and futures expiration dates. There are various tips and advices for beginners. A look at the world interest rates is also provided. They offer forex mini accounts with leverage of up to 1:500, their premium accounts offer leverage of 1:200 and spreads as low as 2. They also offer demo forex trading account. This is a site that provides a free platform for trading with commodities and currencies for multiple pairs. The site offers 24/7 live support to its customers. The latest rates of the popular currency pairs are regularly updated. Trading guides and market analysis tips are available on this site. This site provides access to 4 different trading platforms. There are various research material and tools designed to teach visitors about forex trading. Various video tutorials are available along with access to a free demo trading account. Forex.com also allow trading in commodities such as good and silver. Services: Currency trading, Forex trading research, Practice account. This site offers four different forex trading platforms along with all the research and analysis tools. They are online since 2003 and offer fixed spread. There are various tutorials, forex videos, demo accounts, and a simulator available for beginners. There is also fundamental and technical analysis of the markets. This is the official site of the Swiss brokerage house, Dukascopy. This site provides information about forex trading through Dukascopy. Various forex contests are held along the way, while the site has access to the live TV covering forex markets. This is a group of forex companies and it has been online since 1996. The site provides information about the popular currency pairs and sentiments. The recently successful trades are also displayed along with the latest live rates of the currency pairs. This is the official website of the subsidiary broker at Saxo Bank Group. The site offers information about its trading products like forex and its spreads. There are various articles about starting a new trading account with ForexTrading.com. This is the official site of the Danish investment bank. It offers comprehensive information of the general and trading prices. It provides market insights, forex tools, tips, and education tools. Detailed information of the different plans available at the bank are also present. This site provides access to the Plus 500 trading platform that covers a wide range of spectrum like shares, forex, commodities, ETFs and CFDs. The site has various financial tools including detailed analysis of the charts of shares, forex, and commodities. This site provides an online forex trading platform, which can also be tested using the demo account. Information like latest forex news, chart analysis, technical analysis, and the latest economic calendar are available on this site. This site primarily caters to the traders in the forex markets. There are various tools available for traders like the economic calendar and Fibonacci calculator. The trading terminals are available across a wide range of platforms, while basics of forex trading are also present. This site provides information about the markets like top movers and insights into the technical aspect of each currency pair. There are daily and weekly trade ideas along with complete analysis of the markets on a weekly basis. Various tools and educational resources are also present. This site provides access to the various trading platforms available at the Alpari brokerage firm. All the basics and tutorials of trading in forex and other markets are present in this site. Weekly market reports and research results are provided through this site. FXDD provides comprehensive forex trading tools, while there are numerous platforms for the trading terminal of this brokerage firm. News, commentary, educational resources, and trading tools are available to both individual and institutional users. The site provides forex trading lessons to get the best out of the 4XP trading platform. There are other resources available on the site like daily market analysis and world interest rates. The economic calendar and a trading learning system are also present. The site allows you to manage the FOREXYARD trading account including opening, depositing, and withdrawing money. There are various trading tools like focus on individual currency news, forex calendar, and a comprehensive tutorial of forex trading. This is the official site of the online forex brokerage firm, FXCM. Complete access to the FXCM trading account is provided through this site, while there is also information about spread betting and commodity markets. News and other technical analysis are also present on this site.